Rapid growth in economy and populations has driven urbanization development deep into rural areas with negative impact on rural ecosystem. What approach need to be taken to ensure the eco-system could be preserved and the development for the betterment of rural communities could be achieved? This studio offers design strategy with competitive dimensions for the locals and visitors. 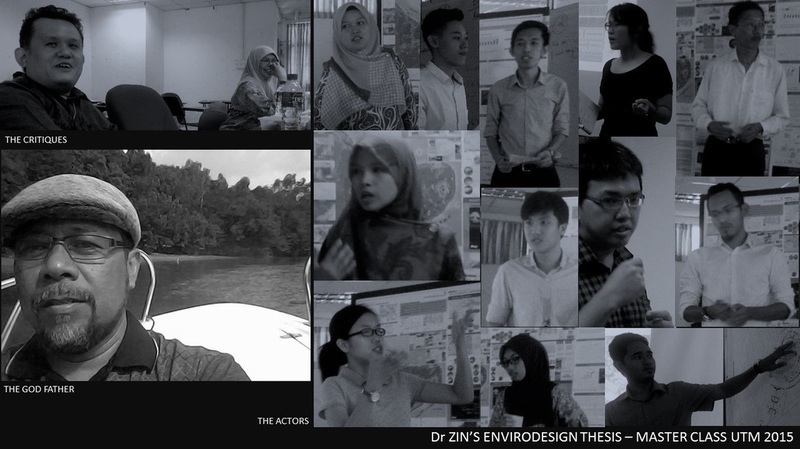 The Pre-Thesis 3 studio is an advanced level studio where skills in research are applied in the ideation that will be conducted on site to form an Architectural vehicle. Selected analysis tools are employed in the schematic design of sustainable architecture responding to context, climate and functions as the core for this studio. Research into the subject matters and Brief crystallization. Translating Brief into Design Vehicle, in this stage – conceptual layout and space planning. Maturity of Thoughts in translating brief, spatial organizations and discourse. Le Tour 01 manifest a better approach whereby she did a Graftification diagram delineating zones with preserved trees and zones without preserve trees, capable to site her building. She allows the zone to dictate her building arrangement. Next, she employed 3D Mass Models in cyberspace to allocate its spatial arrangement and building functions. Credits are given to her ability to seamlessly address the site and utilization of the mass model approach. Le Tour 02 displays a weaker utilization of the massing model, almost rigid as just to create a form. While the mega canopy is acceptable due to its flimsy and temporal nature, there is lack of maturity in spatial arrangement of the internal spaces. Le Tour 03 has a conscious attempt to be ecologically sensitives so much so he erred in the first principles. One cannot dictate a form upon its terrain, but to allow its terrain to dictate the built form. Slicing a rectangular mass as the first principle is erroneous. Forcing the functions into its form resulted in the absence of a centerpiece and all the important nodes scattered without any cohesion. It is a jaw dropping experience looking at the title the actors are proposing. This is an attempt to proposed a full fledged research facilities in a small site. Research 02 attempted to display a sense of phenomenological approach in the form making by challenging the site, that is in a pre-conditioned of beyond repair. Yet, a subtle approach such as a Biosphere such as Nicholas Grimshaw's Eden Project UK, would have been a better alternatives. Unfortunately, his attempt for phenomenological architecture cannot work unless we are all birds. Research 03 attempted to put an Aquaria into the site. 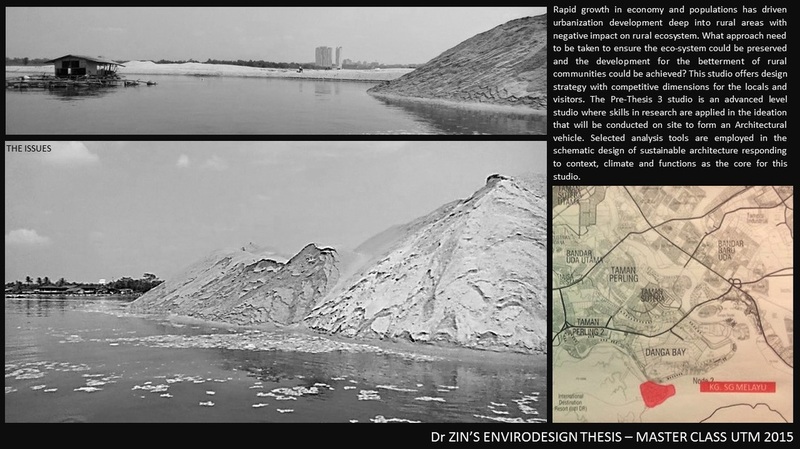 Unfortunately, the model he has is above the ground level that is a most insensitive approach to ecological design. Suggested that his approach may be 80% underground with largely transparent tunnels along the mangrove allowing human conveying belts to view the mangrove from the bottom up. There shall only be a significant yet subdued entry point above ground level. Research 04 is an overcooked scheme. Everything is already there almost ready for construction. Yet every single details embodied a scheme fits for urban renewal and connectivity. It lacks the sensitivity of ecological concerns. Although Mkt 01 has been honest in its approach, but the fundamental considerations of a workable wet market place is absent in its entirety. There is a lack of practical consideration as to how a market functions, let alone reserving 60% of the site for parking? Mkt 02 is an excellent example of a truly functional market in all practical sense complete with its very own BoH, Docking area, amenities areas, Cafe and the sort readily to be upgraded with its state of the arts hydroponics and water filtration system interlocking technology with a non pretentious functions of a wet market. Even its form has been successfully translated from the massing models to its final space planning representation. Spa 01 attempted to recreate 5 stars facilities but the outcomes are pretty shy of 3 stars. Strangely there are hostels with cycling track above. it really miss the spot almost being unimaginative. This is one classic example of an actor being forced to design without experiencing first hand of what a luxury Spa and Resorts are all about. On another notes, scheme liked this is very much lack of the complexities expected out of a Master programme. Spa 02 has shocked most of the critiques with its adamant to circular forms. Apparently a little complicated with the introduction of the living pods among the mangroves, it does not however capitalizes on its strength to over spill its functions from the high land to the edge of the sea and vice versa. The living pods are naturally exciting being lit at night with varying heights. By the end of the Crit, one will reflects that some actors failed to appreciate the intricacies of the Site and the complexities of the Brief. The use of the Massing Models as the initial tool for techtonic has been immature and majority has not able to bridge through towards a meaningful Space Planning, taking into considerations of the practical side of things such as traffic planning, Back of House (BoH) necessities, UBBL compliance and the sort. Many dwells in the realm of fanciful assumptions that does not stem out of research and explicit observations as for example a market that does not serve its purpose, a jetty without its docking area, a research lab that is cramped with illegible spaces let alone not conforming to the fire code, a cultural space that does not have a centerpiece, a displaced conference hall and the unimaginative clustered of chalets passed out as Spas and Resorts. While taking notes of the deficits, some actors has displayed outstanding efforts in proposing a methodology of Graftification of the existing pre-conditions to place their building proposal leading to a meaningful use of the Massing Model such as investigating spaces in 3D rather then 2D, potentially leading to a complex and intricate juxtaposition of spaces. Another point of interest was a delicate proposal with space planning that practically works in real life practices with very little flaws taking into consideration of the practical things in life, others taken for granted, that make things work such as provisions of the BoH, Loading Bays, Docking area, Amenities and the sort that critiques find difficulties to disprove. These are the two very obvious delights that had brighten the outlook of the Crit.